This is hands down the best banana bread I’ve ever had! 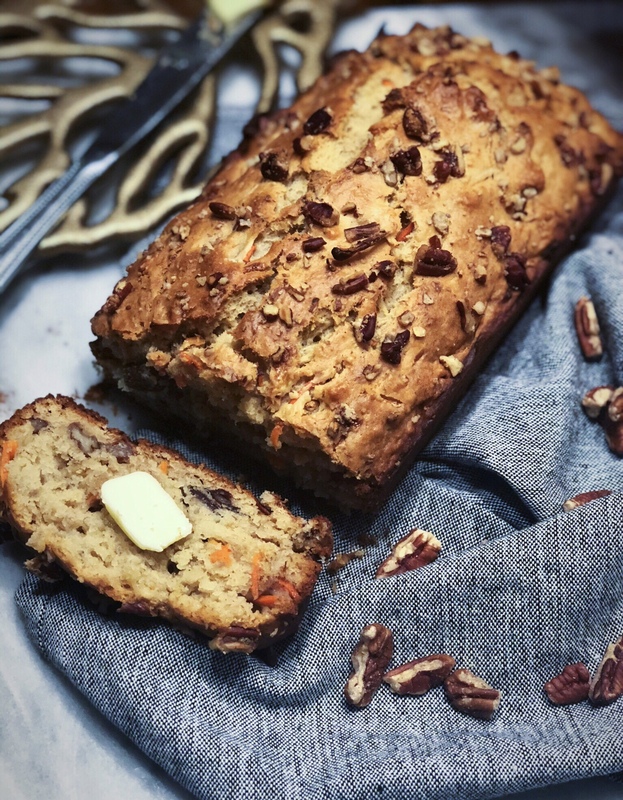 The toasted pecans are amazing and the crunch of carrots in every bite is a must. This bread is great for breakfast and can be topped with a wide array of choices or as an afternoon snack. This is a great option for experimenting and throwing whatever you have remaining in the pantry in. Dried fruit, shredded coconut or chocolate chips would be great additions. The good in this? It is usually common knowledge that bananas are a good source of potassium. But they’re also, like carrots, a good source of vitamin C! Bananas are also wonderful to use as a sweetener in your favorite dishes, especially with the holidays coming up! Preheat oven to 350°F. In large bowl, mash bananas and add brown sugar, agave, egg, canola oil, and vanilla extract. In a separate bowl, sift flour, baking powder and salt. Add cinnamon and nutmeg. Add dry ingredients to the mashed banana mixture and combine. It does not have to be completely combined. Stir in carrots and pecans. Spread batter into oiled or lined loaf pan and top with additional pecans. Bake for 60 minutes. Serve warm.